For many, the idea of studying a foreign language conjures up all sorts of dreadful images: memorizing long vocabulary lists, deciphering arcane rules of grammar, and hearing your own (embarrassing) attempts at imitating the accent. It's a process that seems to require a stellar memory, intense self-discipline, and loads of persistence, all of which can ultimately lead to the question, "How come I never had to put in this much effort to learn English?" For the frustrated and the ambitious alike, The Rosetta Stone 2000 from Fairfield Technologies gives users the chance to learn a new language the easy way. Forget the tedium of conventional textbook methods; The Rosetta Stone dispenses with the whole notion of rote learning. Instead, it simulates the way in which each of us acquired our first language: by associating sounds and written words with objects and ideas. Presented with sets of four photographs drawn from a diversity of cultures, the user simply clicks on the one that corresponds to the words seen and/or heard. After each answer, either the affirmative twinkle of a harp or a low tone of disapproval will sound. 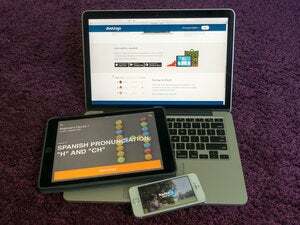 The entire program is structured by this point-and-click method, from first syllables to complete sentences; users easily begin to spot verb tenses and grammatical patterns. It's engaging and addictive -- a passive learner's dream come true. Each lesson in the program focuses on and explains a specific part of speech using clear, logical illustrations. For example, a drill on the tenses of the French verb "sauter" uses a series of pictures that show a boy before, during, and after his jump into a swimming pool. In this way, The Rosetta Stone teaches using pictures rather than words, so those who loathe grammar and whose first language isn't English can use the program with equal ease. To keep things interesting, the program varies presentation (such as a written phrase, a spoken phrase, or a picture) and the manner in which questions are answered (such as by clicking on a picture or word, typing in a response, or speaking an answer). These combinations allow you to focus on a single skill at a time: listening comprehension, reading comprehension, speaking, or writing. The Rosetta Stone 2000 can display text in all languages, including romanized forms, but it doesn't provide any special input methods, which means that writing drills aren't available in all languages. The program's set of voice-recognition utilities, intended to allow users to compare a graph of their own pronunciation to that of a native speaker, is mediocre. It's hard to figure out just how to improve because the comparison is only visual. With its comprehensive coverage of grammar and vocabulary, The Rosetta Stone 2000 is an ideal choice for those who wish to take an academic approach to a new language. It's also a great solution for those who have difficulty memorizing vocabulary or rules of grammar. The Level II program goes beyond the comprehension levels other foreign language software programs offer, enabling users who want to continue to learn in-depth to do so.